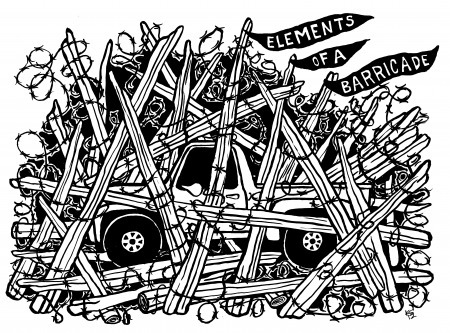 The barricade, as signifier of ruin, is the mystical expression of the catastrophic storm. The fire storm burns out a patch in the forest and opens it to sunlight; in this place grows now a diversity of new life. The storm creates spatial heterogeneity as the disturbances are spread across the land forming pockets of patchiness –each space is a point of succession. This dynamic explodes any equilibrium and in turn initiates new becomings. In the wake of the beautiful storm the barricades grow, what is left is to Make Total Destroy. In Argentina at points of crisis, the militant practice of the piqueteros has generalized across society, with the barricade becoming the manifestation of the categorical demand. The subject of the strike is no longer the working class as such, though workers are always involved. The strike no longer appears only as the voluntary withdrawal of labor from the workplace by those employed there, but as the blockade, suppression, (or even sabotage or destruction) of that workplace by proletarians who are alien to it and perhaps to wage-labor entirely. Posted on July 29, 2012, in Defending Territory and tagged barricades, blockades, native blockades, native resistance. Bookmark the permalink. Leave a comment.